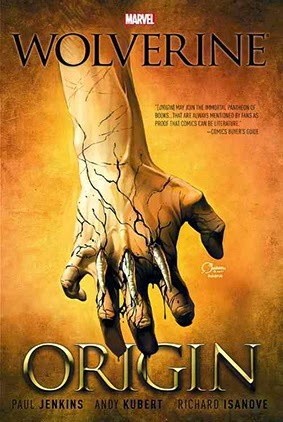 • DESCRIPTION: Collects Wolverine: The Origin (2001) #1-6. For decades, Wolverine's shadowy past has been shrouded in mystery. But before he was the savage mainstay of the X-Men, before he was a tormented secret agent codenamed Weapon X - even before he was a barroom brawler in the wilds of Canada - he was a child. And now, in this landmark event, Marvel reveals all! The birth and childhood of sickly young James Howlett, the secrets and intrigue of his family history, the first struggle with his subconscious savagery that culminated in tragedy, and how James' flight from everything he once knew led to the forging of the man known as Logan! Paul Jenkins and Andy Kubert, two of Marvel's most capably acclaimed creators, unite to tell the tale that shaped mutantdom's mightiest misfit. Written by Paul Jenkins. Art by Andy Kubert. Cover by Joe Quesada. Hardcover, 7 1/2-in. x 11-in., 200 pages, full color.